A showpiece of artisanship, Rosewood will be sold in an absolute auction by Supreme Auctions in cooperation with Gary Giles of Keller Williams Realty – The Woodlands and Magnolia on April 27th, 2017. 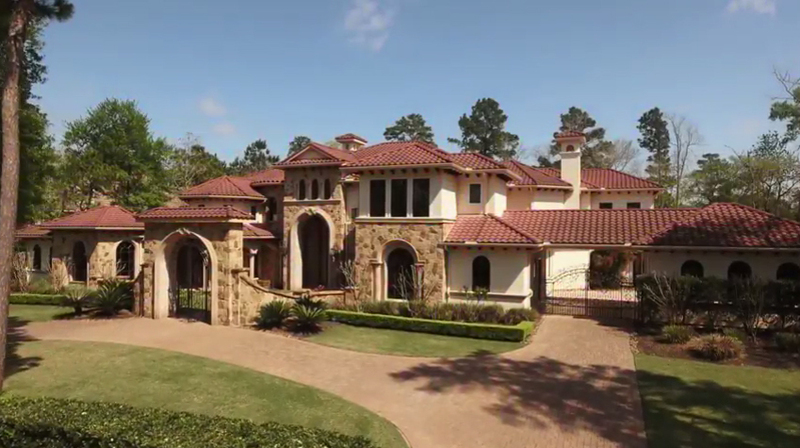 Located on the 10th and 11th fairways of the Jack Nicklaus Signature Golf Course in the sought-after Carlton Woods gated community of the Woodlands, this Mediterranean-style masterpiece has never been lived in. This palatial residence provides the epitome of luxury with no-expense-spared craftsmanship throughout including inlaid marble floors, and hand-forged iron embellishments. Situated on the Jack Nicklaus Signature Golf Course, outdoor amenities rival any five-star resort: salt water pool, hot tub, fireplace, fountains, loggia, and gorgeous views of a wooded protected preserve. A separate casita is perfect for out-of-town guests or the family nanny. Culinary aficionados will relish the home’s gourmet chef’s kitchen, butler’s pantry, and round breakfast room. The formal dining room offers an exquisite view to the front courtyard, fountain and double-gated Porte cochere. Additional showpieces include a plush theater, wood-paneled library, and wine grotto with connoisseur’s 500-bottle capacity. The master en suite offers a serene retreat with Jacuzzi bath and state-of-the-art frameless glass double-shower; an adjacent exercise room is perfect for a daily workout. A guest bedroom en suite – on the opposite side of the residence – provides privacy for all, while second floor bedrooms showcase panoramic vistas across the golf course and protected parkland. A game room and library are perfect for study and family entertainment. The current owner says, “I selected to work with Supreme Auctions because I believe that their marketing reach is second to none and provides a unique opportunity for one lucky buyer to win and ultimately own a relaxed and luxurious lifestyle here on the golf course." The Woodlands is a master-planned luxury community, boasting chic boutiques and first-class retailers that include Tiffany, architecturally-innovative business parks, and outdoor music pavilion. Many move to the area for its first-class amenities set among towering trees and lush greens. Biking and hiking along countless miles of picturesque paths are popular pursuits among residents. No wonder this award-winning master-planned community is home to sports superstars, entertainment celebrities, and CEOs and has attracted the corporate headquarters of Baker Hughes, Exxon Mobil, and Hewitt Associates. “It’s a double win,” said Jennie Heal, President of Supreme Auctions. “The new owner of Rosewood can enjoy the unparalleled offerings of Carlton Woods, its world-class golf, the clubhouse, and the Cynthia Woods Mitchell Pavilion with its international line-up of acclaimed artists and theatre performances. Plus, residents have easy accessibility to Houston’s professional sports, renowned rodeos, world-class performing arts and museums. Rosewood, will be offered to the public at an absolute auction on April 27th, 2017. To learn more about the auction, contact Supreme Auctions at (866) 929-2243 or visit supreme-auctions.com. Supreme Auctions is a leader in luxury real estate auctions, providing proprietary accelerated marketing services unique to each distinctive property represented and sold. With 15 offices across the United States including Hawaii and offices in Costa Rica and London, UK, the company has a dedicated team of auction marketing professionals providing decades of expertise, knowledge, and utmost integrity. Supreme Auctions provides the highest level of service to both sellers and buyers of multimillion-dollar luxury properties by combining experience with the most advanced technology and marketing resources. The company offers sellers and luxury brokerages worldwide the optimal auction strategy to suit each exclusive property, providing unparalleled services in the real estate auction industry.